Since moving into Our new house, I’ve had to lay hands on just about everything we own. We have so many lovely things that never see the light of day. Some of those shouldn’t be exposed to prolonged light just because they are delicate, but others should get more use. I’ve vowed to use more of the “nice things” that we have and to enjoy them. After all, why have them if you don’t use them? 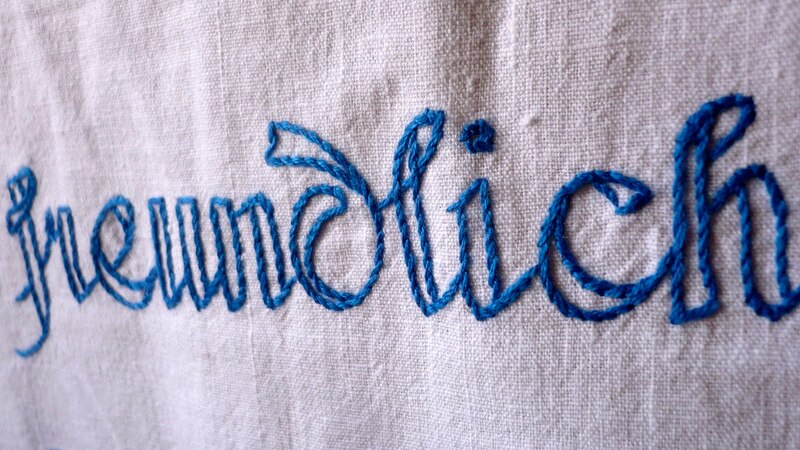 We spent a few years overseas in Germany and I acquired quite a few vintage and antique linens. I loved them, that’s why I have so many! 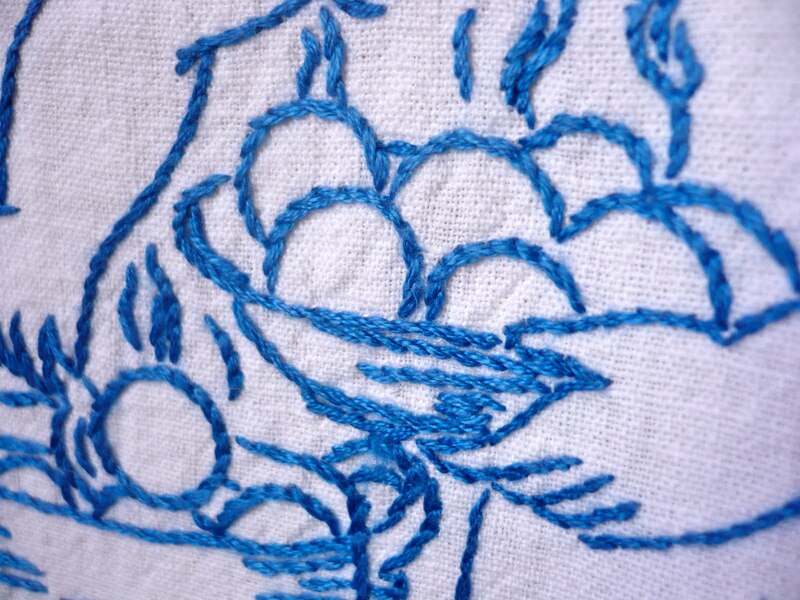 I was especially attracted to the redwork and bluework embroidery pieces. I would pick through mounds of textiles to find that special piece that would make my heart sing. Ein braves männlein mehr brauch ich nicht. A good Husband, more I do not need. Thank you Martin for a better translation than I was able to come up with on my own. The embroidery is very even and detailed. 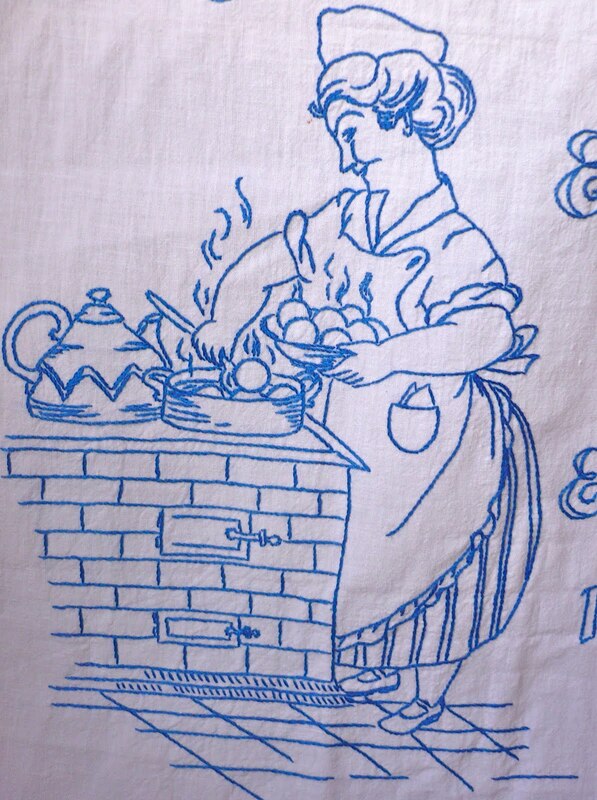 It looks like she is cooking Knödelen which are dumplings made from potatoes or bread which have been poached. It makes be a little homesick for Germany. 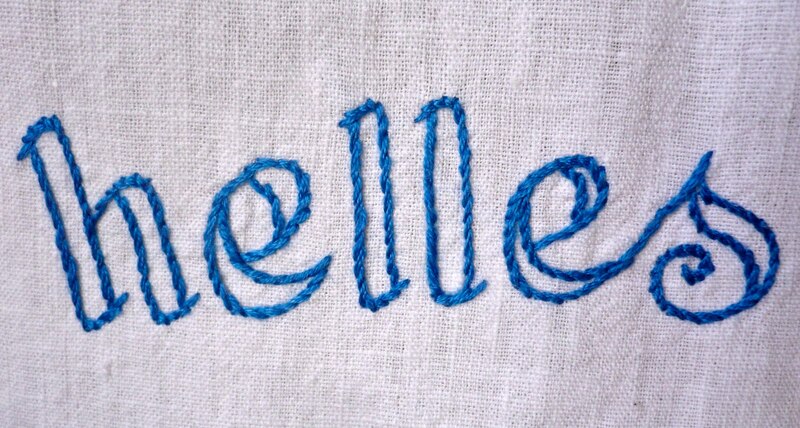 I love the saying, I love the embroidery. It is perfect, no flaws, no holes! A perfect find for a rainy afternoon. I’m going to hang it in my kitchen, probably over a cabinet door, or maybe my backdoor. I want to enjoy these wonderful things and not keep them hidden away in a drawer. Open one of those drawers in your house that you haven’t looked in for a while… and see what you find! Maybe you’ll find a cherished piece of lace that got shoved to the back of the drawer, or maybe just a simple thing that evokes a happy memory. 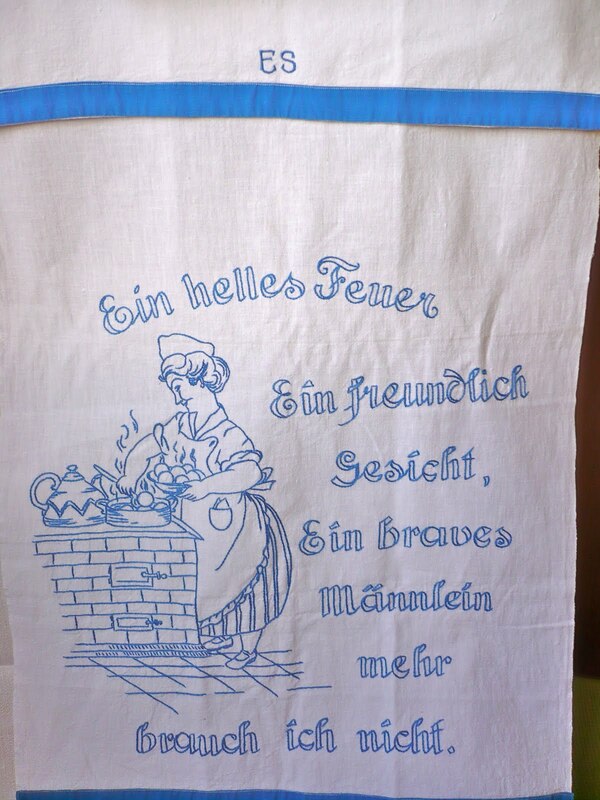 This entry was posted in German, hand sewing, kitchen, Vintage. Bookmark the permalink. Hi there! I am already following your thanks to Tuesday Tag-Along but i just thought i should stop by and see how you're doing.Plus, don't forget, if you need any help increasing your blog's traffic or easy HTML tips, you know where to come! Today we talk about how to create a pop-up window, so come on by to find out that and more! Happy Tuesday! I'm a new follower from Tuesday Tag-Along. I hope you'll come check me out at PS Mom Reviews and follow me too!I have fun giveaways going on now too! What a lovely towel. I love the saying as well. Very nice. Following you back and I agree it is better to display your precious items.